Summer is here and we’ve got everything you need to celebrate, from our most popular existing cake decorating products to brand new and exciting ranges. From weddings Cakes, birthdays cakes and garden party cakes, there’s always plenty of summer events to stock up for so make sure your summer celebration cakes are ready with our top pick of decorating supplies all available from our Sugarbliss Cake Decorating Supplies shop, knowle, solihull, west Midlands. Unicorn cakes remain a top trend in the cake decorating world, having taken social media by storm over the last year. This fun- lled theme uses plenty of colour and sparkle, making it a very popular choice for children’s birthday parties and special celebrations. Check out our simple unicorn how-to guide. 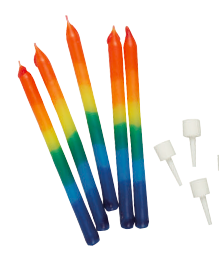 Our selection of birthday cake candles, decorations and equipment are the perfect way to bring fun and colour to birthday cakes and cupcakes this summer. 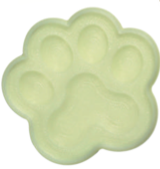 We also have a brand new range of JEM Pop It Moulds available, with new designs to suit a variety of occasions including a train set, animal paws and a cute gingerbread man. So why not stock up on these great new additions today! Making peony sugar decorations has never been so easy with the brand new Easiest Peony Cutter from FMM! The set contains two petal cutters as well as a leaf cutter to create various sizes of beautiful peony arrangements. Ideal for creating beautiful sugar roses for any summer wedding cake design. Using airbrush colours are one of the easiest and most popular ways to add a professional finish to wedding cakes, birthday cakes and decorations. Sugar flair have now introduced three great new airbrush colours to their popular range, including Bubblegum Pink, Deep Red and Grey. All now available at great prices from our sugarbliss cake decorating shop. We love creating these natural fresh wedding cakes. This simple sponge cake allows you to mix and match a variety of exciting flavour combinations, to really create an impact – it’s no wonder it’s become one of the must have wedding cake this summer and is becoming popular as a summer birthday cake or a special celebration cake. One of the advantages of the Naked Cake is its almost limitless creativity. Whether you decide to be prim and proper and have neat and tidy layers of buttercream and sponge or you go for a more rustic, just thrown together approach. Part of the cakes appeal is that it isn’t perfect and all of its imperfections are on show. With all the ingredients exposed to the elements, the sponge and all of its lovely fillings really need to be visually on point. When creating your own naked cake, think about what flavour combinations and colours that work well together. A few combinations which work particularly well together – are lemon sponge with lemon buttercream, chocolate sponge with caramel buttercream and vanilla sponge with a white chocolate ganache. 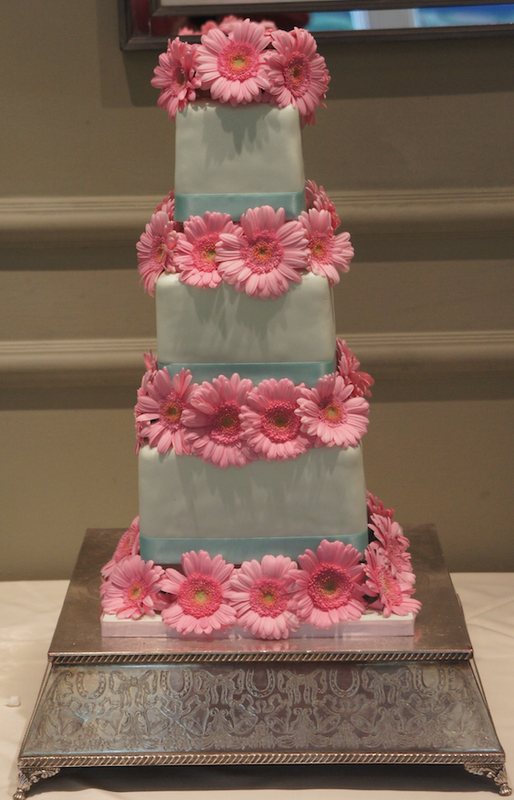 We also create a range of eggless naked wedding cakes and gluten free wedding cakes. Decorating your naked cake is all part of the fun and this is where you can really wild with accessorising. The deep colours of summer fruits is always a winner, as well as bright, vibrant flowers, but you could also try decorating with delicious chocolate or strawberry sauces or even icing cream! 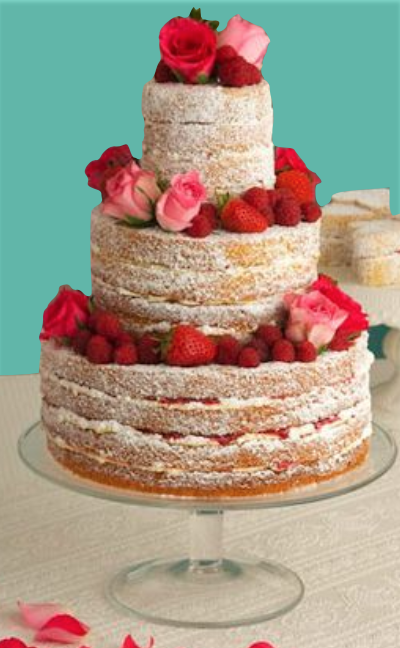 We stock a range of easy to use high quality cake mixes in our cake decorating shop, Knowle, Solihull, from Vanilla sponge cake mix to our tasty Red Velvet cake sponge mix, as well as, everything you need create and decorate your very own delicious but effortless Naked Wedding Cake or Celebration Cake. 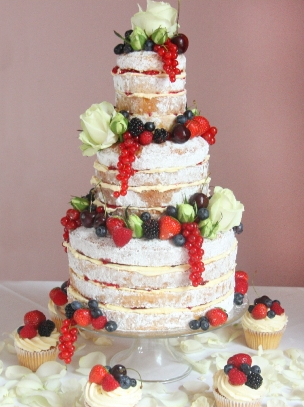 This naked wedding cake design was topped with gorgeous summer fruits and made from a delicious Eggless cake sponge. Loving Everything To do With Naked Wedding Cakes! 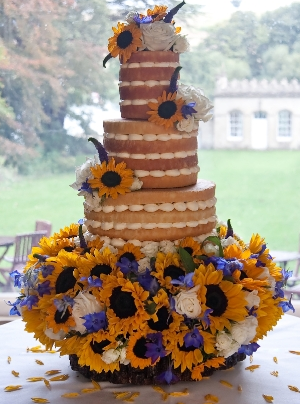 We love the warmth, the longer days and the sunshine, but sadly summer can be a very challenging for wedding cakes and celebration cakes and a bad time for sugarpaste icing and buttercream. With the right precautions we can fight droopy, melted sugarpaste/buttercream and replace it with beautiful, smooth and stable icing. We learn’t very quickly that heat and humidity effects icing. We will be honest and admit that we learned this lesson the hard way many years ago. So with a few tips for ways to use icing in the summer, hopefully you won’t have this problem. Most people do not understand that heat and direct sunlight can weaken,discolour, melt and even collapse a cake, so make sure you inform your clients. If someone is asking for a five tier wedding cake at an outside reception in July, you just need to say, “That won’t work”. Instead, give the client advise. Can they keep the cake inside? Can they only bring it outside at the end of the Reception?Can they keep the cake away from direct sunlight? These are things to discuss with the client before the cake is agreed upon. In our experience our clients are grateful for the advice and follow the advice. If not, they will need to sign a form stating that you will not be liable if the damage to the cake is due to it being outside or in the wrong environment. They will also be liable for any illnesses in case the cake is left out too long since they are going against your advice. That way you are covered and they cannot come back to you for a refund when your beautiful hard work melts in the sun! Keep your cakes chilled in the fridge as long as possible or by using a de-humidifier, but let them come to room temperature before taking them outside. You can get condensation which can ruin both buttercream and fondant. Factor in the humidity and heat of the car during delivery. Be prepared for anything and in the summer take extra precautions (take a delivery kit, etc) to make sure you are covered in case you have problems during delivery. Some new products recently added to our Sugarbliss Cake Decorating Company Online cake decorating supplies shop are the very useful sugar flower formers by Jem. These plastic formers are ideal to make stunning sugar blossom flower heads. It’s highly polished plastic surface means it is perfect for creating blossom flowers. This blossom/petal former aids in drying the petals in the right shape.